Every year, 300 volunteers donate their time to help make the IFLA Congress a success. 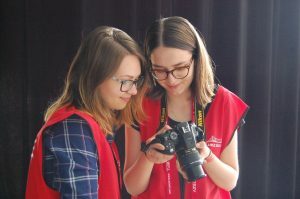 Volunteers assist on site in a number of areas depending on their interests, including the speakers’ room, media centre, registration, in plenaries, exhibition hall, poster sessions, cultural evenings. Volunteers are a key to creating a positive and welcoming atmosphere to delegates from all over the world, and assisting the hosts to deliver a professionally run Congress. Receive free registration! Volunteers are a valued part of the Congress. Outside of your shifts, you will be able to attend conference sessions. Meet and network with stakeholders involved in the library and information services field from all over the globe. Add to your personal and professional growth through taking advantage of this great opportunity. Add to your CV a certificate in appreciation of your contribution to the Congress. If you are interested in volunteering opportunities during the IFLA WLIC 2019 in Athens, please visit the Greek Library Association webpage and apply. Please note that this year only a limited number of international applicants will be accepted.